hall and courthouse will be clos. n ed. The stores, however, will remain open on the holiday. Former Senior Leader Fred 0. Landrum left Sunday for Camp P69, Chfipley, Florida, where he will take his place upon the technical staff as assistant to the Junior Technician. Lthdrum had served as Senior Leader for the Campany since October, 1935 and showed ability and skill in executing his duties far superior to his predecessors. Prior to October, 1935, Mr. Landrum worked as a surveyor in the Park Service division of the camp here. 'Preceding his enrollment in the Civilian Conservation Corps, Landrum resided in Lake City, Floi-Wa, and was transferred to Sebring. Florida from Olustee, FloTida. where this company was previously stationed. andrum's place here is being taken by Arnold E. Eaton. Eaton was former Senior Leader for Co. 5410, P-82, Reidsville, Georgia. Although Company SP-3 shall miss Landrum, we extend a most cordial welcome to our new Senior Leader Eaton. X. A. Boudet, adviser to the Rogers-Post received a letter from Wayne D. Seaman, 1st Lieutenant, 925th C. A., Commander of Company 4467, Georgetown, S. C., requesting back copies of our paper. The Lt. writes, "We are looking for some new ideas. We understand yours is the best in District "F."
The staff was grateful for the acknowledgement, papers were sent immediately with best wishes to the camp commander and those associated with their sheet. Commodore George Jaeger. retired oficer cf the Salvatiun Army, who is residing in Sebring, wa guest speaker at the reguar Sunday morning service held in the recreation hall. Speaking informally and in an impromptu manner, the Commodore related some very interesting and outstanding incidents that he had experienced during his long service in the Salvation Army. Mr. Jaeger, It is understood. composed a poem of the CCC Camp upon its arrival in the city a few years ago. Efforts are beiny made to secure and publish it in the Rogers-Post in the near future. On the night of the election, June 23rd John Henry "Curley" Bell was, for the lack of something to do, wandering around the City cf Sebring, gathering returns of the day's election. Suddenly he noticed a small bird, apparently wounded fluttering around on the street. Then the humane side of "Curly's" life showed itself and caused aforementioned humanitarian to pick up the smq.ll fowl and carry it to the protecting haven of the camp. The next morning a small metal band was noticed fastened around the bird's leg. Upon it was the inscription: Notify Biological Survey, Washington, D. C., ard a number A-102943. A letter was immediAtely written to the organization and an answer is expected within a few days. 1mergeney rations for one full day will be evacuated to the company bivouacs as well as necessary eookfng utensils and eating uten. -Wils. All available boilers and 0. I. cans will be taken and filled with city water on arrival. The camp surgeon will be ready for emergency cases. Weather re. ports will be available through the local telephone and telegraph companies. One army truck will be stationed at the camp, after evacuation, for emergency purposes. Using service truck will be released after the abandonment and will stand by at the temporary camp for further in-structions,. The committee of Commanding Officer, Camp Superintendent ano Educational Adviser, formed as an outcome from the recent distric meeting held at Ocalas, is functioning splendidly. . There are three distinct phases in the Educational Program of Company 453. There are as follows: ed. ucation during leisure hours, sys. tematic instruction on the job and informal education during leisure hours. Mr. Boudet recently stated that informal education during leisure hours is the direct means by which many of the boys become interested in the class work. This phase of the program Is recreational. Pleasure trips, baseball, diamondball, first aid, safety, life saving, glee clubi and dancing classes constitute this end of the system. Correspondence courses are being pursued by three of the young men, two taking bookkeping and the oth.er air conditioning. The number Of instructors have increased, there being nine in November and now there are 18. Educational data, comparing the months of November and May are furnished by Adviser Boudet. November: elementary cou.ifser 5; high school, 5; vocational, 4; informal classes, 4; with a grand total of 18. Enrollment was 192 and the percentage of enrolees attending was 50 per cent. May: elementary courses, 2; high school, 5; vocation. al, 15; informal classes, 6; with the total being 28. Company strength last month was 190 and with the excellent record of 94 per cent for enrollees attending classes. It is with a great deal and persoaial pleasure' h tend my congratulations Camp and the Editorial the -Rogers-Post. Your paper has always teresting, well set up and to the Company. You are n ping up- another notch au only say,-well done and ( you. 5 through the 10th. Clyde Smart and Emmett Barrett, two outstanding swimmers will represent this camp. Smart who has taken part of a life saving course in the Coast Guard in Key West, and Barrett, an excellent swimmer, should walk away with high honors. Accompanied by two boys frm the Miami camp, who will come by train this far, the contestants from this company will leave Saturday morfmng at 7 a. m. in an Arm3 truck, dispatched from the camp and will proceed to Olustee picking up enrollees at the different camp in Florida. boys' return on Saturday July l1th. We, the undersigned wish to acknowledge the success the ROGERS-POST has made and the progress made by the staff in the journalistic field. We have faith that they will be just as successful in their new venture as they w --1e in the past. others throughout Florida is the f act that Work on the ~lorida Bo'tanical Garten and Arboretum would be stopped if the camp were moved. The project is of vital Interest and importapse to tho state at large as the enterprise will be a great benefactor to it. Merchants of Bebring and Avon Park would lose between $ ,000.00 and $6,000.00 a month If Co. 4 was disbanded. The forenamed amount is approximately the Mo. ney that is turned loose front salaries of the enrollees ECW and Army personnels and ill s for supplies used by the services. The survey crew, recently under. took the Job of moving an irlation system from the hammock en. traiee to TIger Branch bridge. The system which cosis.te Of a pump, power unit and pipe line, is fortthe purpose of watering the newly planted Vegetation. A letter was just received from "Polly" Weybrecht, who recently left the CCC to assume his duties as As. 1 ^OGERS-p O .9 PUBLISHED SEMI-MONTHLY BY COMPANY 453, CCC, FLA. SP.3, DISTRICT F T VOLUME I SEBRING, FLORID.\. FRIDAY, JULY 3^936 Â“ Number 40 FUTURE OF C.C.C. CAMP IN LAP OF .V !<>.' EDITORIAL Tim'fe'Â‘?nby chari^ biir conditions of livng and the many phases of life which goes to make-up civilization, but it has net fettered the principles established by that immortal body of men that gave to the people of the United States the Declaration of Independence on July 4, 1776. Incidents that transpired last week in the city of Philadelphia, help recall the happenings that took place in the same place, one hundred and sixty years ago, 1776. It was in this old and famous principality that the Declaration of Independence was signed Â— July 4th. Yes! It was dra,wn up by the Continental Congress which was composed of such great and noble men as George Washington, Thomas Jefferson, Benjamin Franklin, Patrick Henry and many others whose names are familiar to all of us. They arrived for the convention by various modes of travel which were then considered excellent. Some arrived by stage coach, others by horseback, carriage, pony express or barge. The bell (Liberty Bell) that rang ceaselessly for many hours cracked in several places under the strain, is located there. Dijring a very colorful ceremony, when the Democrats were holding their National Couv^ention in the historic city, it was tapped wdth a gavel by an outstanding party leader as others looked on. Last week, thousands upon thousands arrived for another convention. This one, however, was a far cry and different in form from the one held during the Colonial Days. They arrived for the occasion by various modes of travel. Airplanes, dirigibles, trains, mdern liners and automobiles were all employed transporting the delegates and visitors. Our Nation has changed in many aspects. Its boundaries,Â’ populfition, industries, commerce, education are far different but fundamentally the thought of Freedom is the same as in 1776. ORDERSISSUED FOR EVACUATiON IF STORM HITS All Precautions To Be Taken To Protect Life, Property Plans of evacuation of Camp Sp-3 (Co. 453, CCC), in event of po,ssible storms of severity to warrant the abandonment of the camp were promulgated in a Â“Standing Order,Â” issued by Commanding Officer, L. P. Warren, Captain 349th Inf. All available Government transportation will stand by, with necessary drivers and fuel, ready to move on instant notice. Personnel, except those on special detail, will be evacuated to local hotels or county court house, abandonment being made cn orders of che camp commander or his duly authorized representative. The following personnel will remain at the camp site and will protect the Government Property located therein: line officers, storekeeper, company clerk and fo:uen. rollees. Every precaution is being made to assure the safety of all members and provide rations until the storm period is passed. Enrollees, includ(Continued on Page Two) SAFETY PRACTICES DISCUSSED AT MEET Every phase of the theme safety was given in talks at the mass meeting of the enrollees of the company Monday night held in the me.ss hall of the headquarters. W. W. Stephens won the prize of $T00 presented by Mr. Hicks. Selwyn Ives who was scheduled to speak on Â“Americanism and Citizenship,Â” due to being called out of town at the last minute, was unable to appear before the boys. Safety Director G. N. Hicks, in charge of the meeting, was introduced by Captain L. P. Warren. Prior to talks which were given by enrollees, Stephens, Fletcher and Barnes, Hicks asked for suggestions as to the procedure to be used in the meeting that will be held in the future. Wayne Stephens, wrinner, discuss ed at length the safety rules that are used by the Using Service and Army. Safeguarding against accidents caused from sharp and oointed tools was the main point brought out. Earl Fletcher, close runner-up for the prize, gave a talk stressing rules pertaining to the transportation of the boys and the practice of smoking each otherÂ’s cigarettes. Roy Barnes, took as his theme for his brief talk the routine and authentic information that is required by various officials when an accident takes place. PROGRESS MADE BY STUDENTS IN EDUCATION PLAN The Educational system of the camp has made tremendous progress during the past six months, from November of last year through May of this year. Adviser M. A. Boudet has formulated one of the best routines in district Â“F.Â” One of the outstanding achievements has been the fact that the Using Service personnel and the Army personnel have gotten behind the program and are boosting it to their utmost. Every foreman of the ECW teaches at least one class a week in camp. Enrollees receiving instruction on the job (during work hours) last month were 48 or 25.3 per cent which is an increase of the entire total as there were none dui'ing the month of November. A total of 948 man-hours of systematic instruction on the job was given the men. Jobs such as truck trails construction, concrete lining, nurseries, moving trees; seed coHectS^ng, building walks, maps (topographic), survey of grade lines and mechanice were taken up. Another advancement made in education is noted in the number of pupils attending classes, other than those held at camp. At the present tliere are nine receiving in( Continued on Page Two) A Timely Tip Saturday is the Fourth of July. The bank, post office, city hall and courthouse will be closed. The stores, howeverf will remain open on the holiday. SENIOR LEADER IS TRANSFERRED TO CAMP P-S9 Former Senior Leader Fred G. Landrum left Sunday for Camp P69, CHipley, Florida, where he will take his place upon the technical staff as assistant to the Junior Technician. Landrum had served as Senior Leader for the Campany since October, 1935 and showed ability and skill In executing his duties far superior to his predecessors. Prior to October, 1935, Mr. Landrum worked as a surveyor in the Park Service division of the camp here. Preceding his enrollment in the Civilian Conservation Corps, Landrum resided in Lake City, Florida, and was transferred to Sebring. Florida from Olustee, Florida, where this company was previously stationed. Â•LandrumÂ’s place here is being taken by Arnold E. Eaton. Eaton was former Senior Leader for Co. 5410, P-82, Reidsville, Georgia. Although Company SP-3 shall miss Landrum, we extend a most cordial welcome to our new Senior Leader Eaton. PAPER IS PRAISED I M. A. Boudet, adviser to the i Rogers-Post received a letter from Wayne D. Seaman, 1st Lieutenant, | 925th C. A., Commander of Company 4467, Georgetown, S. C., requesting back copies of our paper. 'The Lt. writes, Â“We are looking for some new ideas. We uffderstand yours is the best in District Â“F.Â” The staff was grateful for the acknowledgement, papers were sent immediately with best wishes to the camp commander and those associated with their sheet. LEASE EXPIRES I AND NEW SITE BEING SOUGHT Remoiul Of Corps j Would Be Blow To j Arboretum Project By R. E. BARNES As the situation stands at the ] present, fate of Camp Florida company 453, CCC. is in the balance of time and fortune. For the part ten days officials connected with the Army using service. City of Sebring, and many public spirited citizens have been working ceaselessly in an effort to assure the continuation of the camp in the city and if possible at its present site. Government lease on the building and property in which is housed the office, dining room, supply rooms, recreation hall and other facilities necessary for the army I management expired June 30. Under the present arrangement the I Army has until September 7 to vaI cate, ; Captain L. P. Warren, commanding officer, received a telegram lar? I Monday afternoon to the effect that the lease on the property and building had been signed. The continuaj tion of the lease does not assure j the camp remaining, as forecl'sure (Continued on Page Four* 'SALVATIONIST SPEAKS AT CHAPEL EXERCISES Commodore George Jaeger, retired officer of the Salvation .^rmy, who is residing in Sebring, was guest speaker at the reguar Sunday morning service heid m the recreation hall. Speaking Informally and in an impromptu manner, the Commodore related some very interestlng and outstanding incidents that he had experienced during his long seiwice in the Salvation Army. Mr. Jaeger, it is understood, composed a poem of the CCC Camp upon its arrival in the city a few years ago. Efforts are being made to secure and publish it in the Rogers-Post in the near future. Â‘CURLEYÂ’ BELL HUMANITARIAN On the night of the election, June 23rd John Henry "CurleyÂ” Bell was, for the lack of something to do, wandering around the City of Sebring, gathering returns of the dayÂ’s election. Suddenly he noticed a small bird, apparently wounded fluttering around on the street. 'Then the humane side of Â“CurlyÂ’sÂ” life showed itself and caused aforementioned humanitarian to pick up the small fowl and carry it to the protecting haven of the camp. "The next morning a small metal band was noticed fastened around the birdÂ’s leg. Upon it was the inscription: Notify Biological Survey, Washington, D. C., and a number A-102943. A letter was immediately wTitten to the organization and an answer is expected within a few days. 'IPAGE TWO THE ROGERS-POST ; Semi-monthljpublication cf Co. 453, Fla. SP-3 CCC District Â• F," Sebring, Fla. I Sponsor and Adviser M. A. BOUDET | Editcr W. L. CHESHIRE I /5S't Editcr and Editorialist R. E. BARNES Business Manager G. G. McRAE Sports Editor L. R. KAZAR REPORTERS: Britt, Butts, Whidden, Farr, Rannou, Hemrick, Hutto, McLarty Captain L. P. Warren, Commanding A. C. Altvater, Project Superintendent Tbe first edition of the weekly publication published by members of Company 453, later to be known as the Â“Rogers-Post,Â” was started on September 11, 1935. Although the first edition was one without a name a contest was begun immediately to select a name for it with a prize to be awarded to the enrollee suggesting the most appropriate title for the publication. It so happened ^that at this same time, the world was mourning the loss ef two of our countryÂ’s most distinguished and beloved citizens, Will Rogers, humorist, and Wiley Post, famous aviator, so in honor of these two Americans Enrollee L. F. Singleton suggested the winning name ,Â“The Rc^ersPost,Â” and was awarded the prize. The initial journalistic effort of the staff was b six-page affair printed on a very poor grade of yellow paper. The staff of the first issue was as follows: AdVisCT, M. A. Boudet, associate; Cheshire, Spillman, Morgan, Rannou, Janowski, McBfc^, :Singleton, Csisey, McDowell. The first eight-page Â“Rogers-PostÂ” appeared on December 4 and from then on never came under that number of pages during any publication. At first the art work was done by Red Rannou and then taken over very capably by Mrs. Boudet, wile of the Educational Adviser. 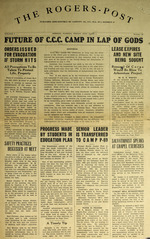 As time went on Â“The Rogers-PostÂ” continued to thrive and before long was recognized week after week in the Â“Happy Days,Â” national weekly publication of the Civilian Conservation Corps. The Happy Days system of rating is: 1 star, below average; 2 THE ROGERS-POST stars.-gGOd; 3 stars, very good; 4 stars, extraordinary and "The Rcgers-PostÂ” was within the 2-star or 3Etar class every week, a record of which we may well be proud. The publishing of our periodical, as is true in any other undertaking required funds, therefore the advertisements of leading business establishments in Sebring and Avon Park were solicited with much success. In this way, our paper was different from numerous camp papers as it is strictly self supporting. And now like any other young and growing enterprise, Â“The Rogers-PostÂ” has decided to expand, and with this expansion will come a regular printed newspaper type publication printed every two weeks and with nationally known products advertised. This type of paper will give our friends everywhere a better knowledge of what is going on in Company 453. With the help of the enrollees and merchants it is hoped that our new journalistic venture will be a success in every respect. O Topic around camp for the past few days has been Â— will the camp remain in Sebring or is it to be moved? O Everyone welcomes the new Sergeant and wishes him the best of luck. It is believed that if more time had been available the position could have been filled from the companyÂ’s rank. We have a few' Â“natural bornÂ” leaders. O The average percentage of participation in the Educational program for enrollees for the month of May was 94. A mark that is fast showing the worth of the educational program in the camp. O Captain WarrenÂ’s evacuation plan is excellent. OÂ— It is expected that our contestants entered in the Life Saving Course, to be held in Olustee, will bring home the bacon. ^ Â— O Â— An unforgetable impression: the ovation given President Rooseyelt by the massed humanity, 115,000 Â•strong. PROGRESS MADE BY STUDERTS IN EDUCATION PLAN MRS. KELLEY PRAISES CGC CAMP AND STAFF OF THE ROGERS-POST COMMANDER MAKES EVACUATION PLANS IN CASE OF STORM (Continued from Page One) ing L.E.M., will stand by for orders dressed in CXJC uniform and carrying the equipment including: barrack bag, change of underwear and socks, raincoat, mess equipment, blankets and canteen (full Cf w^ter) batl) towel,, soap and shaving equipment. '' 2^ ifF Emergency rations for one full day will be evacuated to the company bivouacs as well as necessary cooking utensils and eating utensils. All available boilers and G. I. cans will be taken and filled vuth city water on arrival. The camp surgeon will be ready for emergency cases. Weather reports will be available through the local telephone and telegraph companies. One army truck will be stationed at the camp, after evacuation, for emergency purposes. Using service truck will be released after the abandonment and will stand by at the temporary camp for further instructions. Congratulations to the Â“ROGERSPOSTÂ” KahnÂ’s Dept. Store Sebring, Fla. (Continued from Page One) struction in various subjects at a 1?WA Â‘ school in Sebring. The committee of Commanding Officer, Camp Superintendent and Educational Adviser, formed as an outcome from the recent district meeting held at Ocala, is functioning splendidly, There are three distinct phases iÂ’l the Educational Program of Com-, pany 453. There are as follows; education during leisure hours, systematic instruction on the job and informal education during leisure hours. Mr. Boudet recently stated that informal education during leisure hours is the direct means by which many of the boys become interested in the class work. This phase cf the program is recreational. Pleasure trips, baseball, diamondÂ’oall, first aid, safety, life saving, glee club and dancing classes constitute this end of the system. Correspondence courses are being pursued by three of the young men, two taking bookkeping and the other air conditioning. The number of instructors have increased, there being nine in November and now there are 18. Educational data, comparing the months of November and May are furnished by Adviser Boudet. November: elementary courseÂ’sr 5; high school, 5; vocational, 4; informal classes, 4; with a grand total of 18. Enrollment was 192 and tbe percentage of enrollees attending was 59 per cent. May: elementaty courses, 2; high school, 5; vocational, 15; informal classes, 6; with the total being 28. Company strength last month was 190 and with the excellent record of 94 per cent for enrollees attending classes. (EDITORÂ’S NOTE: Mrs, Kelley, Sebring booster, has been one of the best supporters that the CCC Camp has had since its arrival in the city. She is beloved and cherished by every boy in the camp. It is with profoimd pleasure that the Rogers-Post presents this article by her). It is with a great deal of pride and personal pleasure that I extend my congratulations to our Camp and the Editorial Staff of the~Rogers-Post. Your paper has always been interesting, w'ell set up and a credit to the Company. You are now step; ping u^ another notch and I can only say,Â— -well done and God Ble.ss you. From the first day of a CCC Camp in Sebring, I have been intensely inte?-ested in its welfare, aims, growth and achievements. It has been my privilege to mingle and work with the boys in the camp, and I can only speak in the highest terms of them as I have known them. I have seen them come in as "rookies,Â” developing physically, mentally, morally and spiritually and after months in the camps, passing off into the regular stream of life better equipped to face the odds they all must meet. With very few exceptions, I believe that the boys who enroll in CCC Camps appreciate the opportunities offered them. The interest and attendance at the classes speak for the desire they have to equip themselves for the future. Early in the history of the Camp, the Salvation Army was asked to be responsible for services being held at the camp, using all denominations and holding non-sectarian FRIDAY. JULY 3, IS6 Â’* j services. I was the officer chosaii for this work and the results have I been more gratifying as aPtendance I is not compulsory. To me, because of my inti:nate knowledge of our Camp and its workings. I believe that the CCC Camps have been one of the most practical and successful projects of the New Deal, and that in the near future our country is going to be better, safer and more loyal to the high standards that made it what it is, because of the confidence of this great movement. I have sincerely appreciated the cooperation of the Commanding officers and the personnel. In closing I again say Â“I congratulate you.Â” A crew imder supervision of Geo. Hicks Is completing the grass planting around the reebrd house and the road shoulders located on the grounds. Â— Â— Â— <$> Dutton Motor Co. Auto Radio Refrigerator Sales Phmie 214 Sebring, Fla. | <$; 4 > May the Rogers-Post Meet with All the Success in the World A FRIEND Pan Dandy Bakery Bread Rolls Â“Always FreshÂ” Best IngTedients Used ill Â• Â— Â— Â— ^ ^ ^ Sebring, Fla. Â“CONGRATULATIONSÂ” W. H. Hires Â— Quality Produce Â— Tampa, Florida MorganÂ’s Barber Shop Â“Satisfaction GuaranteedÂ” Sebring, Fla.